If you get the opportunity to purchase directly from the fisherman then this is by far the best way to buy your fish. You know it will be really fresh and there is a sense of satisfaction in buying direct – like buying produce from farmers markets. Wherever you buy your fish you should find that the fish has at least been gutted. Don’t be afraid to ask the person serving you to decapitate it or fillet it for you too if you’d rather not do it yourself! Supermarket fish counters have a good variety like fishmongers shops. Some supermarkets get their stock from central distribution centres so in some cases a fish may have travelled long distances before arriving at your local shop. Depending on the day you may or may not find that the person behind the counter will be able to advise you. Some supermarkets will also use fish that has previously been frozen so it is important to ask whether this is the case with the fish that you have chosen as you will not be able to refreeze it. The local fishmonger is a good place to purchase fresh fish. Local fishmongers source the majority of their fish directly from their local markets so the fish is guaranteed to be fresh. 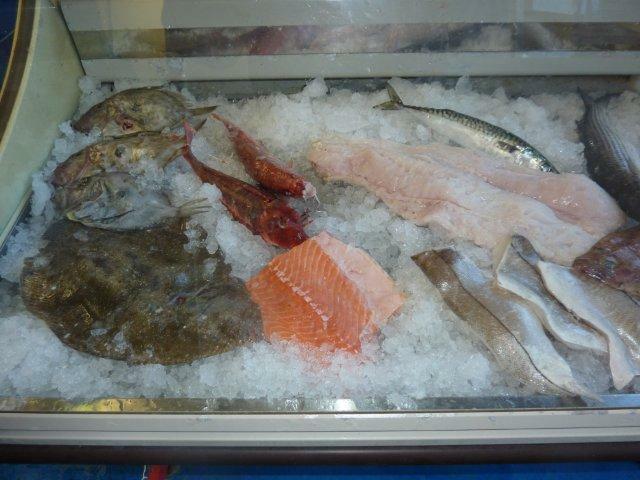 Fishmongers are very knowledgeable about the products they sell and will be able to give recommendations and guidance. They will also be willing to prepare your fish to meet your requirements so we definitely recommend paying your local fishmonger a visit. The image on the right shows a tagged fish. These tags have been developed by the South West Handline Fishermen’s Association and show that the fish has been line caught. The tags have an identification number which is used for traceability. 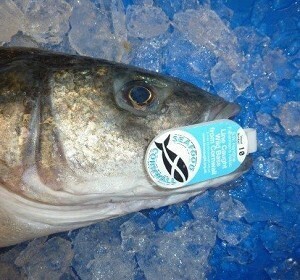 If you purchase a fish with one of these tags you can enter the number on the Association’s web page to find out who caught your fish and where it was caught. 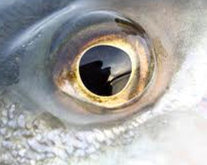 EYES – the easiest thing to check when buying fish is the eyes as these will tell you whether the fish is fresh. You should make sure that the eyes are bright and clear without a milky appearance. They should also not be sunken as this would indicate that the fish is not fresh. SKIN – the skin on a fresh fish should be moist, shiny and firm. To test for firmness press lightly on the side of the fish – the indentation should bounce back and not remain indented. Unfortunately most shops and supermarkets will not be very happy if you start poking their fish! SMELL – fresh fish do not smell unpleasant. Instead they smell of the sea. Fish will not keep fresh for long and one of the first indicators that a fish has been dead for a while is the smell. More information about fish smells can be found on our Getting Rid of Fish Smells page. 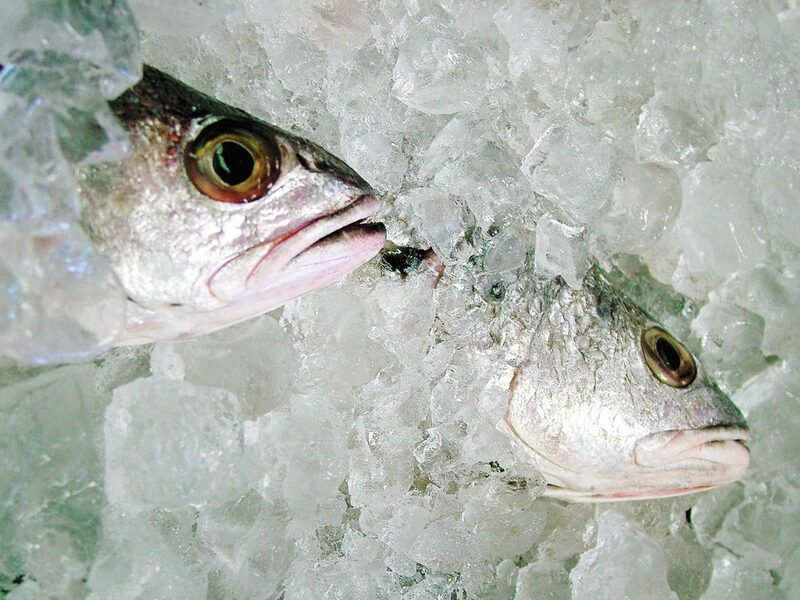 Don’t be put off by the thought of buying frozen fish. In many cases fish is prepared and frozen while still on the fishing boat and is therefore frozen when it is at it’s optimum. Freezing fish quickly as soon as possible after it’s caught will result in lovely eating fish when it is defrosted. If you are unsure what quantity of fish you require for your recipe then feel free to ask the fishmonger. If you are going to be serving a whole fish then it is easy to work out but it is not so easy to work out how much fish you will end up with when you fillet a flat fish, for example. You will be able to get 4 fillets from a flat fish, but depending on the size of the fish, these can be very small. 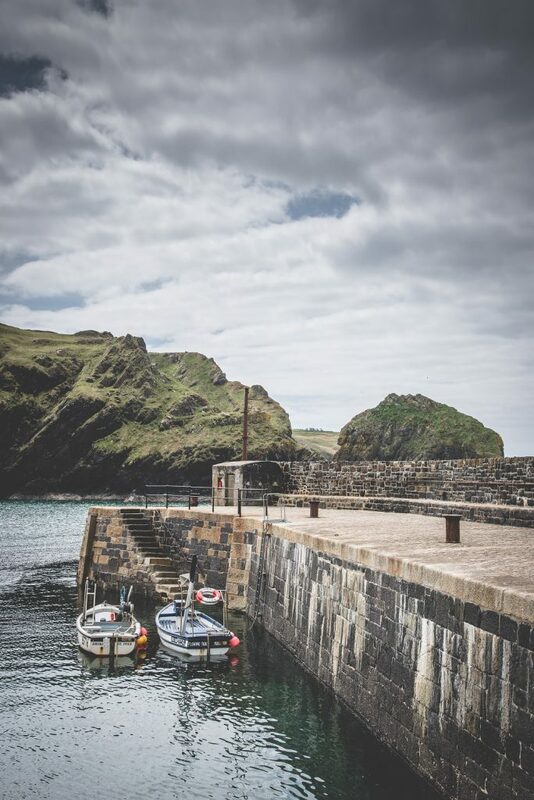 Larger fish and round fish such as mackerel, whiting or pollack will provide two good portions – one fillet from each side of the fish.